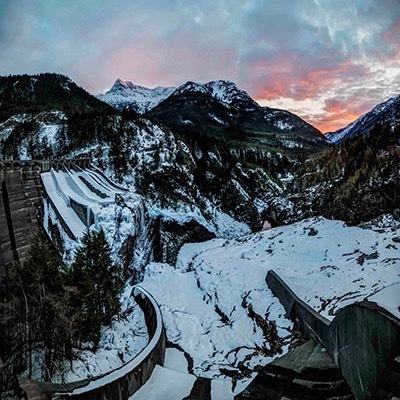 2019 Love the Loop Photo Contest! 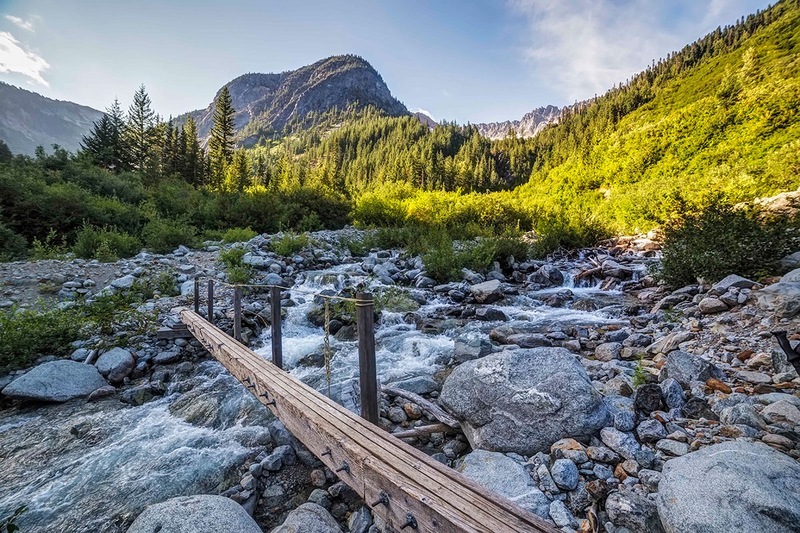 The hike from Skagit Valley, over Cascade Pass and down to the remote village of Stehekin on the shores of Lake Chelan is one of the classic hiking routes in Washington State. 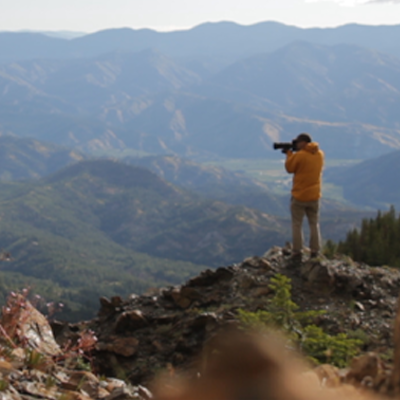 The trail follows an old Native American path used for millennia to cross the mountains. 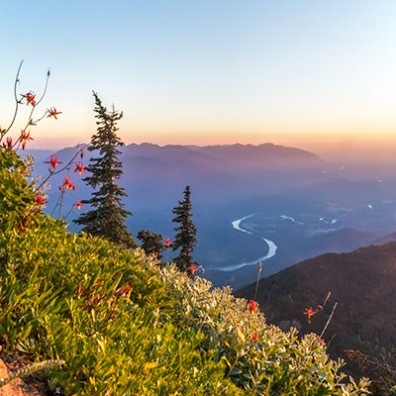 It is a 23 mile (37 km) hike from the Cascade Pass parking lot to High Bridge, where shuttle service is available to Stehekin. Driving up the North Cascades Highway, which is a part of the much longer Cascade Loop Scenic Highway, to Marblemount and up along the Cascade River Road my heart always revs up with excitement. We made an early start and schlepped up the 40-something switchbacks to Cascade Pass. Dropping from Cascade Pass the trail navigates around the upper basin and soon passes the Pelton Basin campground. It’s not long before the switchbacks start. Whereas the trail up to the pass from the Skagit side is completely in forest, here the trail is exposed to the hot sun. Hiking down here I am already dreading the trip back up! 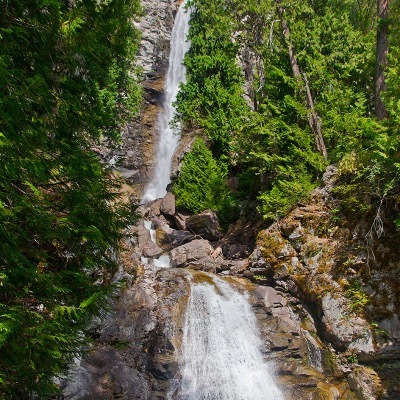 One nice surprise was the waterfall along Doubtful Creek as it bisects the trail on the east side of Cascade Pass, where there are small pools providing a much needed break and swim. Many people who make the sojourn from Cascade Pass to Lake Chelan make a straight trip from the parking area to Stehekin, with no side trips. But there are two of the most awesome valleys in all the North Cascades (Horseshoe Basin and the North Fork of Bridge Creek) that you should not pass up as you make your journey. The trail follows the stream up from the trail junction into Horseshoe Basin; it follows a course along the stream, across the stream and in the stream, brushy and wet. Shortly the trail emerges into a clearing where boulders dot the basin floor. Climbing up on the largest, the view is transfixing. The green bowl is surrounded with grandeur, full of color and drama. The basin was aglow in the afternoon light, orange granite spires surrounding the lip like fangs, too-numerous-to-count waterfalls glistening, their sparkling waters plunging down into the valley. There were wildflowers popping out everywhere, yellows and purples, reds and blues, all accenting the deep green of the basin floor. We hurried on, racing the sun, heading up the valley, climbing across boulders and scree, on to a snow field, up to the gaping hole of the Black Warrior Mine. The Horseshoe Basin trail is less than 2 easy miles from the trail junction to the head of the valley and the Mine. 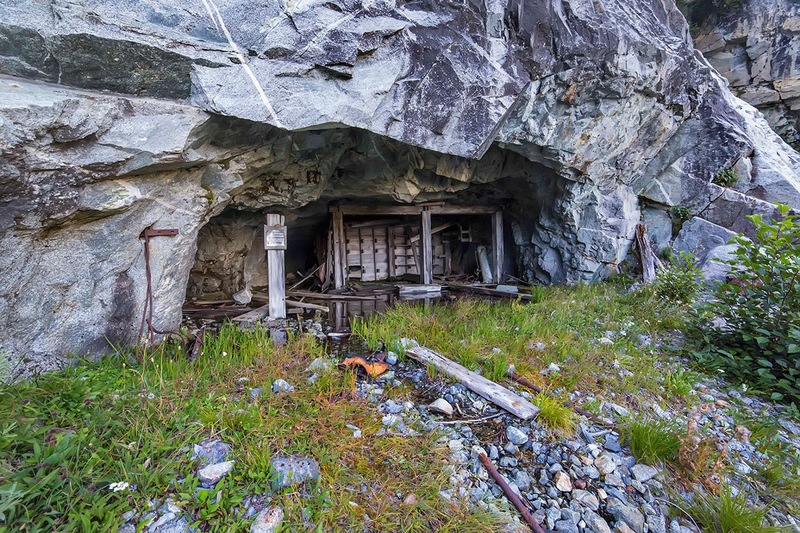 The North Cascades are full of old mining claims; piles of colorful tailings and rusted remains of sluices and Pelton wheels littered about. 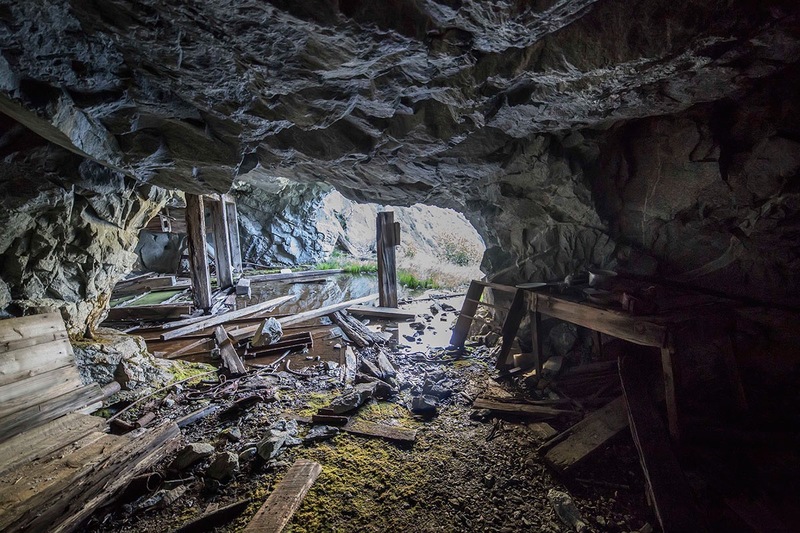 But I had never visited a mine that I could enter and explore. The Black Warrior Mine operated until the mid-1950′s and is a National Historic Place. There is a sign at the entrance giving a brief history of the mine, the names of the prospectors and misled investors who poured their mostly futile efforts into this hole. There are two main cavernous rooms blasted into the mountain side which make the opening of the mine. One of these “rooms” served as a kitchen while the other was used for workbenches and tools. Wooden supports and floor boards are flooded with water. Old tables and remains of habitation litter the floor. The shaft of the mine runs deep; several miles of tunnel remain, open for any brave person to explore. The wonder of the place is still with me. Maybe its the history, all of the people who worked so long and hard here, digging and scraping for naught. Here, as in many of the North Cascade valleys, it was miners who blazed the trails that we now use to visit the high country. The road from Stehekin, long ago, came all the way to the mine entrance. Over time nature has reclaimed the road, now vehicles can only go as far as High Bridge, 17 miles downstream. The falling sun chased us out of the valley, we camped at Basin Creek camp. The next morning we started our pleasant hike along the trail to Cottonwood Camp and on towards our rendezvous with the shuttle bus at High Bridge. Our timing was perfect; we made it to High Bridge (On the Stehekin River Road) and caught the North Cascades National Park shuttle down the valley. Along the way our jam-packed tourist bus passed a huge black bear and her two cubs foraging for berries; I was disappointed to miss the chance to visit and capture a few images, but my chance would come soon enough! 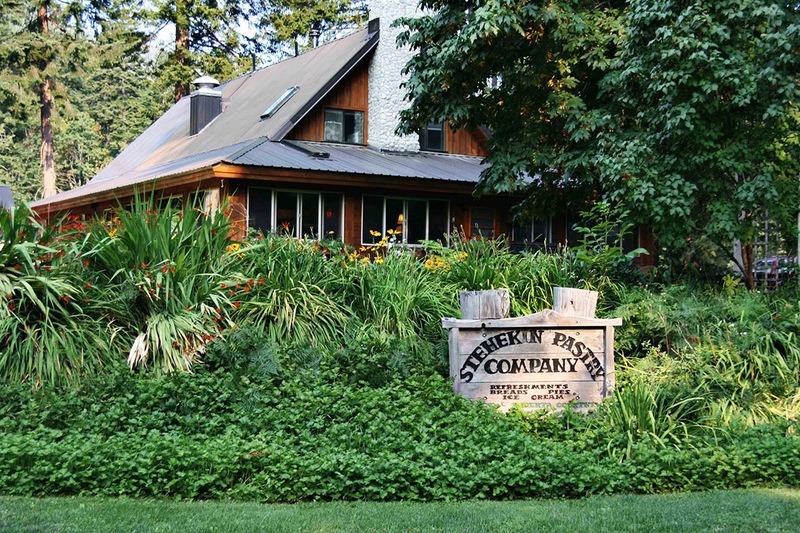 Every hike to Stehekin must includes a visit to the Stehekin Pastry Company. Delicious, fresh treats, ice cream, espresso, friendly staff and a comfortable place to relax…we went here first and ate as many pastries as we could hold. It was a hot day in Stehekin. So we took shelter at the local restaurant and then took the bus back up the valley to visit Rainbow Falls. The 300 foot cataract provided lots of cooling! Everything about Stehekin is awesome. Its remoteness (you can only reach it by hiking, ferry boat or float plane), the people are cool, scads of awesome things to see and do...even the Post Office is a neat place to just visit! Next we visited the old Stehekin School house and then the local organic farm. Now we needed to await the last shuttle bus back up the valley, and what better place to while away the time than at the Stehekin Pastry Company! The last shuttle was full when we boarded and headed back towards High Bridge. But after the bus stop at Courtney Ranch we were the only ones left for the rest of the trip. From the "bus stop" at High Bridge we hiked 5 easy miles to the trail junction at Bridge Creek and camped the night. From here you can make a side trip to one of the most remote valleys in the North Cascades National Park. The trail is called the North Fork Bridge Creek Trail and its remote because its a one-way affair, not a through-trail. The round trip from your camp at Bridge Creek along the Cascade River road to North Fork Meadows and the head of the valley is 16 miles, but the hiking is not strenuous. You head east on the Bridge Creek Trail (which is also the Pacific Crest Trail here) to the scenic North Fork Camp. The trail climbs a few short switchbacks to a junction with the North Fork Trail, head left, north. 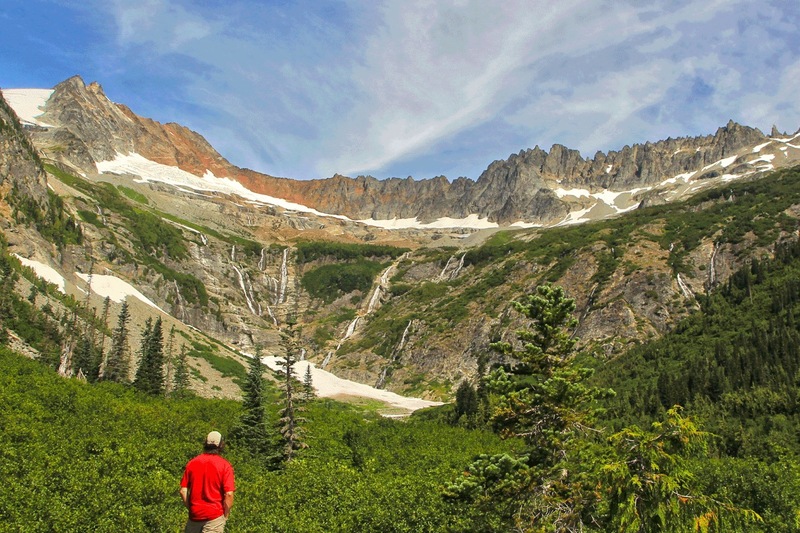 The trail passes Walker Camp and soon you'll get a glimpse of the wonders of the valley. Continuing along the way you'll pass Grizzly Creek Camp and have to ford the creek. 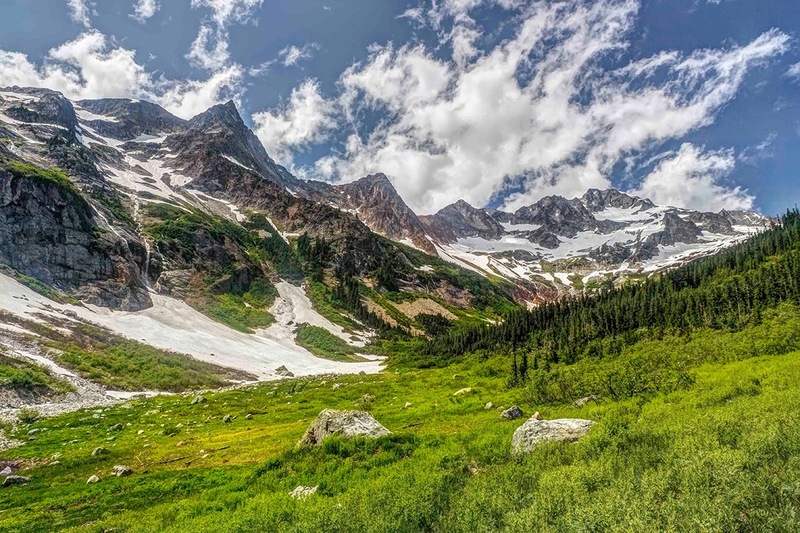 As the trail meanders its way gently upward the trees thin and you'll break out into a spectacular meadow with views of Goode Mountain (highest peak in the North Cascades National Park) and Mount Logan at the head of the valley. From here the hike is almost all out on the open, the North Fork Meadows is a wonderful green wonderland. 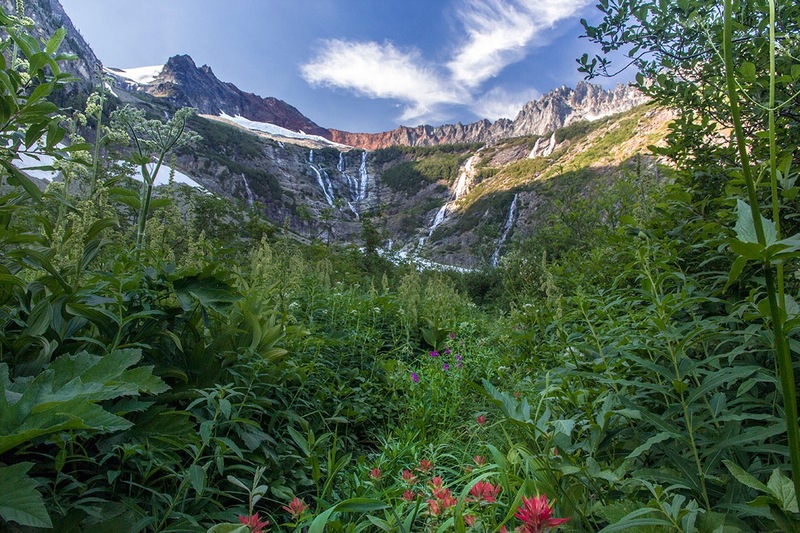 Wildflowers bloom, bears forage and waterfalls stream down from the glaciers above. The path winds its way up, passing numerous waterfalls to its terminus at the base of a wonderful cataract. here you are surrounded on three sides by steep peaks, cloaked in glaciers with countless waterfalls. When you can finally pull yourself away, its time to head back down the trail to your camp at Bridge Creek Camp. The next day we continue our hike back up towards Cascade Pass. The hike along the Stehekin River Road is in itself fantastic. The river cuts a deep cleft through the cliffs at High Bridge and the confluence with Bridge Creek creates a wondrous series of cataracts and islands. The next day we again left before sunrise, hoping to beat the heat on our way up to Cascade Pass. We reached Basin Creek with its flown-in foot bridge and were greeted by a nice breeze and perfect skies. If you would like to visit any of these places with a very small group and learn photography skills at the same time, here is your link! Tracing our earlier steps from a few days ago, we hiked up into the valley, but this time not all the way to the mine entrance. I worked on my mostly futile efforts to capture the grandeur of the flowers, spires and waterfalls, and then we headed back down to our packs and continued the slog to Cascade Pass and back to the parking area. The change in flora as I trudged up the switch backs was enormous. The lower basin on the east side of Cascade Pass is filled with Cottonwood trees and Douglas Fir. A few miles above the trail traverses the mountain side and is bereft of any plants, just crushed rocks and boulders. Then the trail swings south and starts its zigzagging route upwards. Here the path is choked with slide alder. As the trail approaches the upper basin just below Cascade Pass the temperature dropped considerably. From sunny to misty, the forest was now populated with tall sub-alpine fir and a carpet of evergreen needles covered the trail. It was like we had been transported into a new landscape. We arrived at the top of Cascade Pass and stopped to re-energize before flying down the switchbacks to our car. Gazing east, down the valley which we had just climbed I marveled at the beauty of the mountains. And I was already planning a return trip.